HYO Fall Concert – Invitation to the Dance! Students of the HYO present great orchestral music taken from famous ballets of Tchaikovsky, Shostakovich, Prokofiev and others. Orchestras include Huntsville Youth Symphony, Sinfonia, Philharmonia, and Concert Orchestra. The concert is free; tickets are not required. For the Holiday Concert the HYO orchestras will play a selection of holiday and light classical favorites. HYO orchestras feature overtures, arias, and choruses from the world’s great operas. 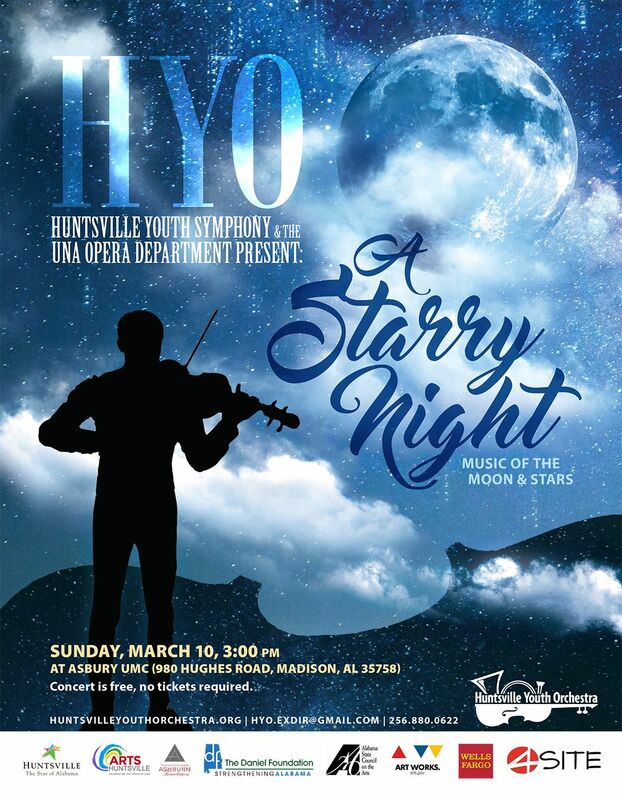 The Huntsville Youth Symphony, in collaboration with the UNA music department, presents a spectacular concert of operatic favorites. The Huntsville Youth Orchestra Grand Finale Concert will feature music from the Silver Screen. With guest artists. Tickets are required, but are free in advance at the Trinity UMC office. Tickets are only required for the Carols of Christmas concert and are free in advance at the Trinity United Methodist Church office. Please consider making a donation to support these exceptional opportunities for our students! Concerts are in the main sanctuary on the North side of the Trinity Campus. Parking: Free on-site parking in the parking lot.